You can grow grass in red dirt if you first amend the dirt to make it more fertile and well-draining. The problem with red dirt is that it's comprised of clay, which is a heavy planting medium. Clay dirt contains thousands of tiny particles that stick together and cling to wetness. So, the dirt is highly compacted and does not contain air pockets for root development. Allow a few days to amend red dirt, when you know the weather will be dry. Plan to plant the seed in the spring or early summer, to give it time to germinate before winter. Remove rocks, weeds and sticks to create a clean planting surface. Work the shovel under the larger rocks to help lift them out. Run a rototiller over the yard, loosening the top 4 to 6 inches of red dirt. If there are any low-lying dips, fill them in with topsoil and rake them to level them out. Dips will cause water to pool, which can wash away grass seed. Test the pH of the dirt. You can buy a pH test kit from a home improvement center or nursery. Grass does best in neutral pH, so if it's between 6.0 and 7.5, you don't need to amend the dirt. Increase the pH of acidic soil by applying hydrated lime to it. Mix in 12 oz. of lime per square yard to boost the pH by 1.0 point. Use the test kit to determine the new pH. If it the pH is still too low, add more lime. Amend the pH of alkaline soil by mixing in 3.6 oz. of ground rock sulfur per square yard of red dirt. Combine it well with the rototiller. Add compost, such as manure, leaf mold, wood chips, sawdust and peat moss to red dirt to make it more fertile. Combine 3 to 4 inches of the compost into the dirt. Make sure it mixes into the top 4 to 6 inches of dirt. Spread a starter fertilizer over the planting area with a broadcast spreader. The seed bag will specify how to set the machine. 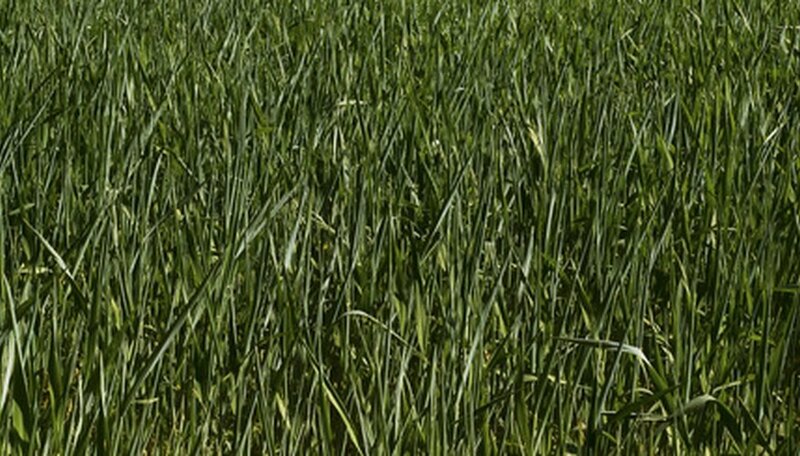 Starter fertilizer helps the grass seed develop roots faster. Fill a mechanical spreader or hand spreader with the appropriate amount of grass seed. The packaging will tell you how much seed to use per square yard. Use the hand spreader if growing grass in a small area and a mechanical spreader for large areas. Gently cover the grass seed with 1/8 to 1/4 inch of soil. Run the back of the metal rake over it. Water the grass seed twice a day, letting the water soak in for five to 10 minutes. Cut down to once daily after two weeks. Don't let the red dirt dry out, or the grass seed may die. Wait until the grass seedlings are 3 inches tall to mow it. Cut it to a height of 2 1/2 inches. Choose grass based on the region you live (see Resources). A nursery can also provide advice.